Where shall I begin with The Room? Maybe the fact it’s dubbed “the Citizen Kane of bad movies” by Entertainment Weekly? Maybe the fact that 10 years on it still sells out theatres across the globe? Maybe the fact it is one of the worst films I have ever seen in my life? No kidding, considering the poor acting, TERRIBLE editing, meme generating script and such. 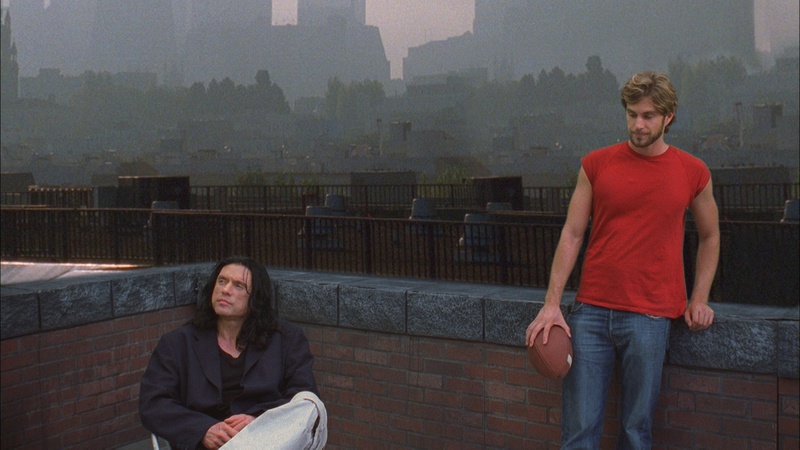 But wait, The Room is also one of my all-time favourite films, I’d go as far as to put it in my top 50 films list! The film department’s probably in tears hearing this, but they have to understand that The Room is just something else: Once you enter The Room, you can’t quit The Room! Tommy Wiseau as the director, star, writer and producer predicted over 10 years ago that this film would conquer the world and look at how right this mystery man is. Basically, this film is terrible beyond belief. Wiseau stars as Johnny, a successful banker in San Francisco whose life begins to crumble as his friends betray him one by one. A very simple plot, but the main narrative isn’t the major problem with this film, I won’t go into massive detail but I’ll ever so slightly hint. Firstly, the editing doesn’t make sense as a whole and the acting is beyond poor, Wiseau’s performance as an example is just so odd for various reasons. He has a very unusual accent which is so humorous and hard to understand at times but you really can’t help but love his ever so dramatic (sarcasm intended) portrayal of a sweet guy. Because of his mysterious persona, he refuses to reveal where he’s from. Many believe France, some Eastern Europe and some even go as far to state he is in fact…an alien! Because of the poor acting, a lot of the dialogue had to be dubbed but it is so out of sync with the film itself due to editing. That’s it! 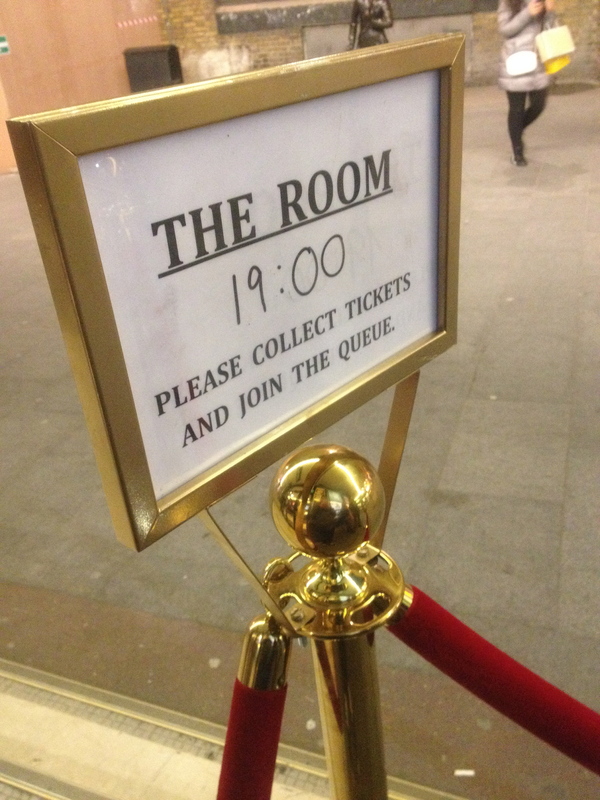 I will say no more, just watch The Room and forget everything you know about film! 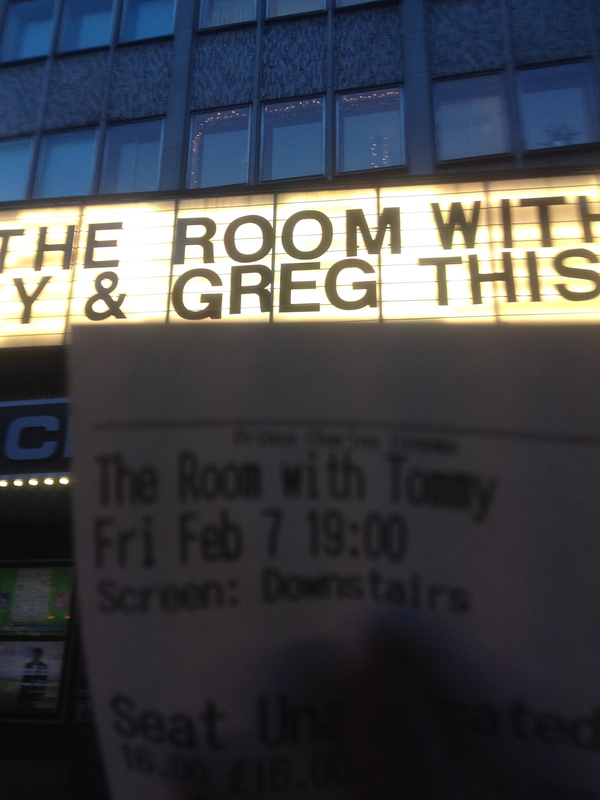 In December 2013, I did my usual routine of searching through what the Prince Charles Cinema in Leicester Square was screening and discovered that TOMMY WISEAU AND co-star Greg Sestero would be there in person for a Q&A screening in February 2014. I immediately booked my ticket and learned that they sold over 1000 across one single weekend. So there I was, first in line queuing an hour and half early before the Q&A begins, when suddenly, half an hour before…there they were, Greg in all his glory bearing a Drive Scorpion jacket who walks straight into the cinema after giving me a quick smile. Tommy runs along the line of the queue wearing nighttime glasses and two belts whilst people cheer his name. He then comes up to me with a simple “Hi. How you doin’?” offering his hand which I gladly accept. The PCC lay down the ground rules: No metal spoons, no American footballs, no booze. Simple. I entered, dropped my coat off at the front and ran to get a signed DVD and a pic. I was to a certain degree starstruck, just at the fact these guys are involved in a cult phenomenon…and of the fact Tommy is one of the weirdest people I’ve ever met. Greg passes the DVD to Tommy who insists on shaking my hand again two more times. Then after the picture (see below) I walk away offering my thanks when suddenly Tommy grabs onto my shoulder and once again, insists on shaking my hand for the forth time! 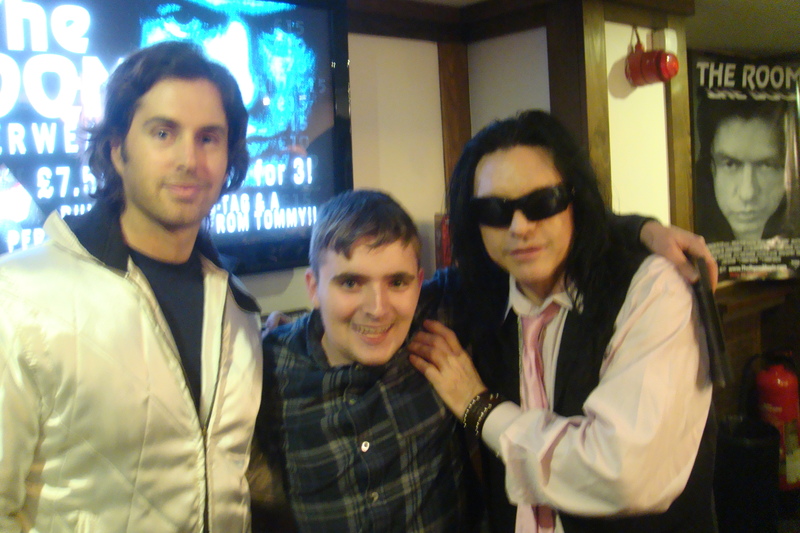 Still can’t get over that’s actually me with Greg Sestero (left) and the man, the myth, the legend, Tommy Wiseau (right). The Q&A experience was fantastic and downright hilarious! Questions ranged from “Favourite film?” to which Tommy would answer what everyone expected: “Citizen KAAAANE!!!!”. Tommy also offered blessings and dog-tags on stage to whoever bought Tommy Wiseau brand pants, and of course the blessing was beautiful “*name* In the name of the Father, the Son and the Goly Dhost hope you have a happy 2014 MOVE ON!!”. The film was screened and without a doubt it was one of the best cinema experiences of my life. The crowd was so enthusiastic about the whole thing, just constant cheers and screams of the film’s flaws along with devout participation; such as the repetitive tracking shots of San Francisco, to which the audience is meant to scream: “MEANWHILE IN SAN FRANCISCO!”. There was also the throwing of plastic spoons, but I’ll let you as the reader find out the purpose of it (however, if you do know, then in that case: SPOONS!!). The whole thing was an hour and a half of me just laughing away at a screen which I’ll never forget. Seriously though, please watch The Room. 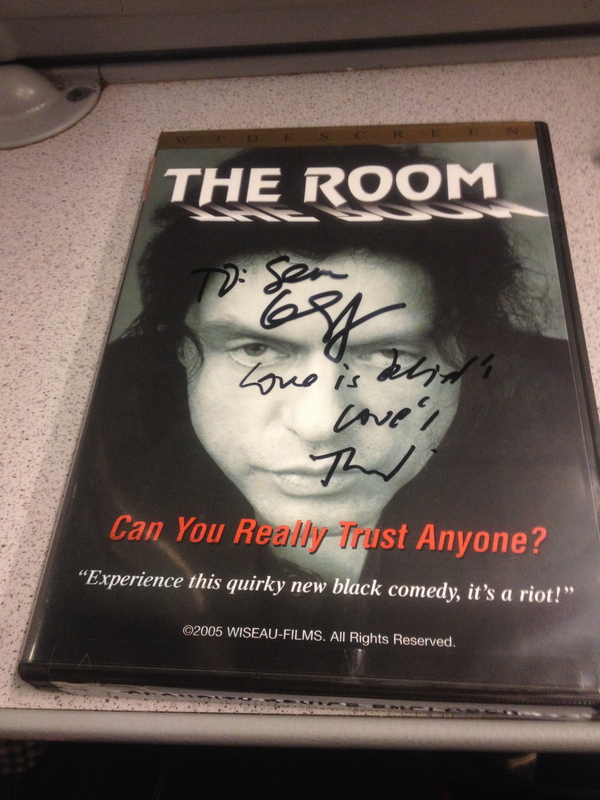 Tommy was kind enough to write “Love is blind” along with his signature!